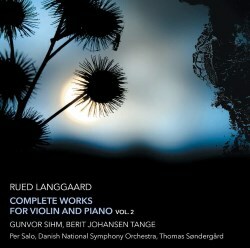 Volume 1 of Ruud Langgaard’s complete works for violin and piano was an enjoyable find for me and, in my review of it I looked forward to hearing more (review). Sure enough, here is the next instalment - Volume 2 of the planned three-volume cycle. Having already sketched a brief biography of this somewhat strange composer in the last review I’ll spare you a repeat of that. Let it suffice to say that his works showed considerable early promise but his introverted and eccentric personality and criticism of the Danish musical establishment of the 1920s closed many doors to him. After his death in 1952 it looked as though he would remain a footnote in musical history books but a renaissance began in the 1970s, slowly gaining strength and, by about 2015, Langgaard was recognised as one of the most important Danish composers of the twentieth century. His works for violin and piano appeared throughout his creative life and the policy in the present traversal seems to be to contrast early, mid-life and late works rather than to tackle the music chronologically – as was done in DaCapo’s earlier traversal of the music. On this disc we get just early and late works and the interesting thing here (particularly after the somewhat iconoclastic music of Volume 1) is the relative lack of stylistic contrast between the purely violin and piano elements of the programme. Perhaps that is, in fact, the thinking behind the programming. The Violin Sonata No.1 appeared in 1915 and, somewhat astonishingly for a 40-minute work, was composed in only four days. Despite the number, this was actually the composer’s second attempt at a violin sonata – the two-movement torso of his first effort having appeared in 1911 (this is recorded in Volume 1). The composer revised the sonata (principally movements I and III) in 1945, when he added the French title “Viole” (Viol). Although long passages are written for the lower violin strings it is not immediately feasible to perform the work on the viola and the title is probably a mistranslation. It is now thought that the French title Langgaard should have used was “Alto” (Viola) to indicate that he originally wanted to achieve a sonorous viola-like sound rather than the distinct sound of the viol. The first movement (Maestoso fiero espressivo) begins arrestingly with a very powerful declamatory piano introduction (and the listener is advised not to have the volume up too high to start with!). The violin enters with “an unusually low, chromatic theme, played on the G string”, making use of slurred octave leaps, which is to be the basis of development. There is plenty of variety in the music and I can safely say that this is memorable, although there is little of characteristic Langgaard eccentricity here. In fact, this movement sounds very much as though it could have been composed by a high-quality disciple of Schumann and could have appeared fifty years earlier. The same could equally be said of the first subject of the following Scherzo movement (Molto allegro scherzoso). It is only when we get to the waltz-like middle section of the movement which (as the booklet notes put it) “gropes its way forward without ever getting off the mark” that we begin to encounter the unconventional stylistic variation more typical of the mature composer. The switch back to the Molto Allegro of the movement’s opening is achieved by an unusual key shift in the piano, which is probably also characteristic. The improvisational slow third movement was originally marked Lento molto e molto amoroso but the composer had second thoughts and changed the marking to Lento cogitoso (thoughtful, mournful). Either would serve perfectly well for this introspective piece, although it could be criticised for cogitating a little too much. The final movement (Molto allegro marcato) is particularly Schumannesque and, whilst less memorable than the first two movements, brings the work to a satisfying conclusion. I shall return to this music with great pleasure. The short “Andante religioso” is actually the composer’s last work for violin but you would hardly know it. It shares the Schumannesque sound of the sonata but is slightly less interesting. In fact, the composer prescribes that the accompaniment should be for organ (without pedals) but “the accompaniment is of a piano-like nature and the piece has often been performed with piano accompaniment” so, in spite of apparently having an organ handy at the second recording venue, the producers decided on piano – possibly missing a trick. The performers are excellent and the recording is vivid. Sihm’s gutsy tone will not be to everybody’s taste but I feel that these performances are to be preferred to the slightly more colourless approach taken by Serguei Azizian and Ann Øland on the earlier DaCapo cycle of Langgaard’s violin and piano works (review). Actually, the sonata timings of the later release are all slightly longer but this is largely down to greater variability of tempi – with slower sections appreciably slower – rather than slower tempi all round. The final work on the disc is a bizarre compendium. The “Sunday Sonata” comprises what were originally three distinct compositions: the first two movements (originally bearing the same title) are for violin and piano; the third is the organ piece “Marble Church Prelude” and the last is the so-called “Small Grand Symphony No 1, for orchestra with organ”. The violin and piano elements, a Poco allegro marcato and a Langsam, intraengende (slowly and earnestly) continue the Schumannesque flavour. The first movement has a humorous touch and the second is notable for having been tweaked from the original so that it modulates from A flat to F major, from where the organ takes over in the third movement – a reverential, short organ prelude. The fourth movement is similarly short and opens with an orchestral fate motif – a triton – followed by a quiet, musing organ solo that suddenly gets much louder. Finally, there is a shattering ten-bar coda on full symphony orchestra (eight horns!) with a brief variant of the fate motif before a final stabbing D minor chord. Originally a programme suggestion that the composer sent to the Danish Broadcasting Corporation, and which was ignored, the work seems to have coalesced in Langgaard’s mind as a unified composition with which to make a statement. As the excellent booklet notes put it: “..the work also has an autobiographical dimension. The ending can be seen as a protest, a fist pounded on the table, where the composer expresses his powerlessness and displays the absurd situation in which he finds himself……in a society that has no use for his music”. Here, the performance of the “Sunday Sonata” (a world première recording) seems to have been patched together from elements recorded in two separate venues. This practical arrangement means that all the disc’s violin and piano programme elements are presented in the same (chamber) acoustic and organ/orchestral elements of the final work are in a much larger and quite different acoustic. In addition, whilst the last two movements were actually recorded in the same venue, the scaling back of the organ’s contribution in the orchestral context initially makes it sound as if the venues (or at least the recording levels) were also different. For that reason anybody listening to the disc straight through probably needs to view the final work in terms of the original three separate compositions. That said I can’t help thinking that the alternative of having all the incongruous elements of the Sunday Sonata together in the same (large) acoustic would have served the composer’s intentions better. No matter – it’s bizarre whichever way you present it. This is another entertaining volume in the new series – albeit for reasons different from those in Volume 1 – splendidly performed and recorded throughout and the Violin Sonata No 1 really should find a place in the wider standard repertoire.